Attention of girls, is their prize. Above all, you have to rise. Will work hard, till sunrise. Towards him, feel the attraction. Away from tv, games, great self-control. The more great he sounds. Work very hard in gym. Before it makes you fall. Well well who doesn’t want to be a millionaire. Some millions in your bank account is not a bad thing . Does it? But day dreaming is easy and making it reality is not so easy. So does it is impossible for most of the middle class people to become one? Does becoming a millionaire is so difficult that out is out of our scope? Well believe me it is considerably easy enough then it seems. Now the main question. How so? What is the mantra to become a millionaire? It is nothing new – a simple word we all know ‘savings’ and investments. The meaning is that a tree bears fruits only when the season comes. It takes time to happen. It cannot happen just overnight. But it does not mean the Gardner should stop his work until the season comes. The tree needs good care the entire year. Without care, it will not bear fruits. Your bank balance in no different. By just saving and putting it in the bank we can easily retire as a millionaire. For example, take that I save just ₹5000(or any currency) each month. With 5% annual interest rate (of course compounded) and no initial savings, what will I have in 25 years? Wow. Close to 3 million. Imagine what it will be if I can save ₹15,000 per month. An average middle class can save even more. Do you know the reason that has made the 2008 economy slowdown such a big deal was just lack of savings? Usually westernize do not believe in savings. An average American saves less than 10% of his income. This makes them very much dependent on economy conditions of their country. Hence, they are hit very hard when economy cannot support then. The aim of a well earning middle called person should be to save between 50 to 70%. It is a myth today of you are earning more you should also spend more. Buying a new car or a bigger home or the latest smartphone on every six months may give you happiness for a few days. Do you think you will actually be happy with skill these. There are material things. The can make you happy for a short period until you grew bore of them and start looking for something else. (it always happens with me when searching for Rpgs ). You will never be satisfied with these. Such these can lead to no improvement in your life either finally, mentally spiritually etc. etc. Do you know that the value of a car of halved the moment you buy it. The figure is 1/3 rd for your smartphone. Instead of spending on these material goods, why not spend on something that actually improves your life. Like investing in real estate or gold or something like that that can help even your children. Or buy educational apps for them. Or admit then on some courses like dancing, sports etc. whatever they like. Or do some charity that will give you the most satisfaction. Or just put it in a bank for the retirement. Seeing your bank balance grow is a fun in itself. This all ,I have learnt from my father. He also earns around an average middle class man. He has saved around 50%of his income from the first day of his career. Even when financial condition of our family were not so good. Now, the figure is more than 70%. Still we are living a very satisfactory life. I can do anything I want because Papa has made my life finally very secure and full of happiness. Thank you papa. So think about where you are spending your money. Is it actually worth it. Don’t be fooled by every advertisement you see. Think about your retirement when you will not have a stable income. Think about what you will leave for your children when you die. Hope you will like this article and take something with you before closing it. Please share your views on this and enjoy rest of the day (keeping in mind what you have learnt). My family is quiet well off from the blessings of Krishna and of course Papa. We have everything we need and luxuries want. Just 2 hrs ago I was watching a movie on our Bravia Led tv. Just now I was playing Counter Strike condition zero on my DELL laptop. Now I am writing this blog on my Xperia Z1 smartphone. Papa has provided us with everything we need. From our basic needs to be costly luxuries. But there was a time when my family was not so well off(much before I was born). Around half a century ago, in 1957 papa was born to an extremely poor mother (Amma – my grandmother). It was the time only 9 years after the India Independence. The circumstances of the country was not good. The economy is its in its initial stages. There is large scale unemployment. My grandfather owned a small tea shop in the small town of Arki situated in the country side of Himachal Pradesh. He was second born to Amma. Four followed in coming years. With the 5 siblings my father was grown up in the small town. Despite the poverty my grandmother (Amma) imparted him best possible moral teachings possible. Though she had only studied till 5th class, she believes that education is as important as 2 time meals. Despite her poverty she admitted all her six children in the local primary school. (which will prove to be her greatest gift for the entire family). Her moral teachings and unconditional love will not go to unawarded. My father joined school in 1963. Immediately he proved his talents and devotion to study in all subjects especially maths. He wanted to support his mother in every way. Soon he started gaining scholarships after scholarships (I have to hide my face when compared to him). He was never dependent on others for his education. It was not that easy. Lots of ups and downs came in his life. My father knows that he would also have to support family in some way. There were many times they couldn’t able to afford 2 square meals. My father along with tau(his bigger brother) and Amma had to cut their stomach to be able to feed the younger once. My grandfather was not so good. What I can say? He did not care for his family when they needed him the most. The income from the small tea shop was usually spent on his cigarettes or his love for non veg. He is not in this world now. But memories he have left behind are not happy once. With such responsibility I don’t think any child would feel like continuing his education. But my father don’t let this stop him. Even the desire to change the circumstances of the family become the greatest motivation in his life. There were some very depressing time. Like one time he needed to purchase a practical file for his school. But grandmother has no money for it. He was told to submit the file next day only. He purchased 1 kilo of jaggery for 20 paise(1 rupee = 100 paise). He spent entire evening cutting it in shape of toffees and wrapped them in pieces of newspaper. He went to market to sell them for 3 paise each. Till the dead at night he sold them all an earned around 45 paise. That was his first income. He finally buied file for 35 praise and gave the rest to his mother. Such dedication I don’t think is possible for me. I shall prefer not going to school the next day. But my father thinks entirely different. He believes that not submitting work on time will raise questions to your dedication. When Papa reached 8th class the family shifted to a bigger town Bilaspur. My grandfather rented a small general store. Usually my father had to help in the store after the break. He had to usually miss periods after the break. ( i always feel a little guilt when I bunk for hanging out with my friends). Despite of teacher’s complaints, my father study with full heart. 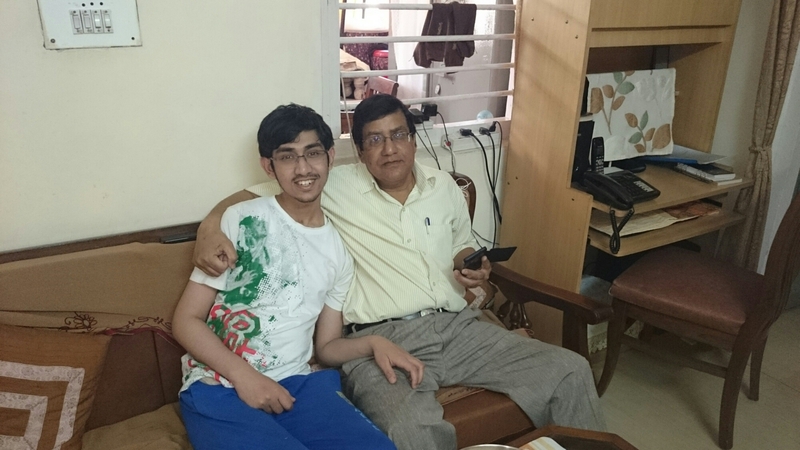 Because of his hard work, he stood 4th in Himachal Board Exam of 8th class. When he passed matrix (10th class), an important decision was waiting for him. In India after 10th students have to choose from 3 disciplines – Humanities, Science Or Commerce. My father wanted to take commerce. It was his dream. But at that time Commerce was not offered at his school and of course he can’t afford to go in some big city. So killing his dream he opted for Humanities and pursues BA (Bachelor Of Arts) in political science. That was hard time for him. He always wanted to pursue Commerce. But he studied whatever he got with full day devotion for his family and topped in second year of college. 2 months after the results he got the call that will change his life forever. He was selected for a job in the government. He was really happy at that time. Completing his education he immediately joined the job and family shifted to Delhi. In the free time, he decided to pursue his dream. He started studying commerce. Without any tuition or coaching he passed the entrance test for ICWA ( bachelor degree in commerce) in the first attempt. (My sister has passed this test in 3rd attempt even after getting the best coaching available). On completing ICWA, he was promoted to the rank of the officer and everything changed forever. It may feel like a made up story. But it is the true story of my father. 25 years later he have 2 children (me and my elder sister). Father has given us a life full of love, dreams and luxuries. He has tried to give us everything that he can’t get in his childhood. May be he is not Steve Jobs or Mahatma Gandhi but to us he is a man born for greatness and source of endless inspiration. Thank you papa for everything. I promise one day you will be proud of me as I am proud of you. (it is one of my main inspiration for started blogging). Many many thanks to you also for reading. Enjoy your life but never forget what your parents have done for you.